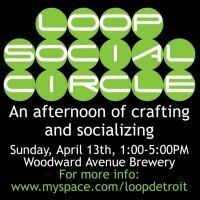 The Loop Social Circle is an opportunity to meet fellow area crafters, get your craft on, and have fun! Please bring a craft of your choice to work on (please no glitter, or oooey-gooey stuff). There will be a $3 cover, to pay for the venue rental. Cash bar, and food will be available. Please feel free to come anytime during the afternoon, bring friends, and repost!